Often, the yeast you use will be able to eat through all the sugar you supplied in your mead. Especially if you properly supply them with nutrients you may find they can surpass their stated alcohol tolerances. This makes it difficult to calculate ahead of time what your finishing gravity will be based on what your starting gravity is. Almost all of my batches have fermented to be bone-dry. Luckily you are not doomed to only have dry meads! You can back sweeten mead, which just means to add more sugar (usually in the form of honey) to your brew after it has finished fermenting. In order to back sweeten, you must first be sure your mead has completely finished fermenting. Adding more sugar to an active ferment may just be raising the potential abv, and provide no residual sugar when he yeast are finished. So unless you are making a sack mead (very high abv) and are willing to push the yeast past their limit to be sure you have sugar remaining, then you will have to wait until they have finished. A good indicator of this is when your mead has clarified. A large part of what makes the must hazy is the yeast floating in suspension. When they’ve eaten their fill, they will clump together (flocculate) and sink to the bottom of the container, joining the lees. Alright, your mead is clear. Now what? As I previously mentioned, if you just add more honey now, there is a chance that you could reawaken some yeast and restart the fermentation. Even if you racked your mead off of the lees, there is still some floating around in suspension. To be absolutely sure, there are three methods available to us to prevent restarting the fermentation: stabilizing the mead, filtering the mead, or pasteurizing the mead (heating it just enough to kill off the yeast). Filtering is a more advanced technique that requires some special equipment to essentially pump your mead through a filter pad. The pad has to have a filtration value below the size of the yeast (which are quite small) around 1 micron. This has the potential to also pull out some of the large molecules that contribute to the flavor and color of your mead, so be warned. Many commercial wineries and breweries filter their products in this manner. Most homebrewers will choose to stabilize their mead. This is a fairly simple process requiring two chemical additives: potassium sorbate, and potassium metabisulphite. They’re both relatively inexpensive, and a small amount stirred into your mead will prevent the yeast from being able to reproduce, thus stopping any fermentation in its tracks. They are not very good at stopping an active ferment, however, so must be added after it has completed. These chemicals take a little time to work, so mixing them in the day before you wish to back sweeten is recommended. 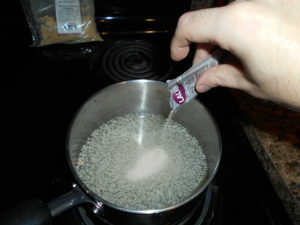 In the small quantities used, (Use 1/2 tsp. per gallon for potassium sorbate, and 1/4 teaspoon per 5-6 gallons for potassium metabisulfite) they do not add any detectable flavors. Note: Potassium metabisulfite is an allergen for some individuals. This is a common additive in commercial wines, so you would likely know if you are already affected. Just be aware when serving to guests. Now the mead is clear and stable. It’s a good idea to grab a quick gravity measurement before adding anything, if you haven’t done so already. We now can proceed with the back sweetening. Take your desired sugar: honey is quite common for meads, fruit juice or whole fruit can be used to strengthen that flavor of your melomel, maple syrup for the acerglyns, brown sugar is common in cysers (apple mead). If you use lactose (which you can buy as a powder) you wouldn’t need to stabilize as yeast are unable to metabolize it. As the desired sweetness is a very subjective thing, there isn’t formulaic way to go about it. Some brewers target a specific gravity after sweetening. This is probably easier for a recipe they’ve used before, as the other flavors in the mead can lend the perception of sweetness to the mixture without having any actual sugar. You’ll likely have to experiment. Add the sugar in slowly and taste it until you find the spot you’re looking for. If you don’t want to risk your whole batch, you can take a small sample out and figure out the necessary ratio to get to your desired sweetness. 16 cups to a US liquid gallon makes for an easy to use starting point. Mix it up and you’ve now sweetened your mead to perfection! The above method is a perfectly serviceable way to sweeten up your mead. It is also likely the easiest way to do so for relative beginners. However, there are are a number of meadmakers that swear by there being a better way. They argue that adding fresh honey to an already fermented mead will taste like just that: mead sweetened with honey. I have not experienced this first-hand, but the theory is that honey that goes through the fermentation process, even if not fully eaten up and turned into alcohol, will not have quite the same flavor as the fresh stuff. It could be that the simpler sugars or other nutrients are eaten first, leaving the more complex ones behind. The process of fermentation will also introduce a lot of fine flavors caused by the yeast strain. They can introduce esters and phenols that can make for defining characteristics of your drink. Raw honey would likely cover those up. Whatever the reason, essentially the honey is changed somewhat to be less of a candied, cloyingly sweet flavor to a more subtle and smooth sweetness. The mouthfeel also changes during fermentation. The honey gets thinned out and homogenized throughout the solution. The secret here is to have a batch of very sweet, plain mead ready to mix into your new batch. This blending will raise the sweetness of your main batch, but not overpower it with its raw honey flavor. It will also be easier to measure out to a precise amount than plain honey is, which can be important if you are aiming for a specific gravity. What if I want to back sweeten AND carbonate my mead? The above method is great for flat meads. It can also work fine if you want to force carbonate your mead in a keg, as that doesn’t require any additional fermentation. Read more on kegging here. However, if you want to bottle carbonate your mead, stabilizing your mead will prevent it from being able to use any priming sugar you add to get that CO2 produced once it has been bottled. But not stabilizing it could have the yeast ferment more than you expect, with the extra back sweetening sugar, an create a bottle bomb. The one solution that could work for bottle carbonating is the pasteurization route. You’d have to monitor the bottles closely to make sure they are at the proper carbonation level and then heat the bottles in hot water to kill off the yeast. The best way to do this is to have two plastic bottles filled with your mead alongside the other glass ones you intend to fill. This will allow you to give the bottle a squeeze test to determine how carbonated they are. Fill one plastic bottle first, then the other at the end of bottling. This will give you the fill spread of carbonation rates. You’ll need a large pot filled with water. Heat to 190 on the stove, then turn off the heat. Carefully place your bottles into the water, keep them there for 10 mins. Repeat for the next batch until you’ve finished them all. This can take some time, especially if you are using beer bottles. Remember: Normal wine bottles are not built to withstand the pressure of carbonation.